Released as “Sgt. 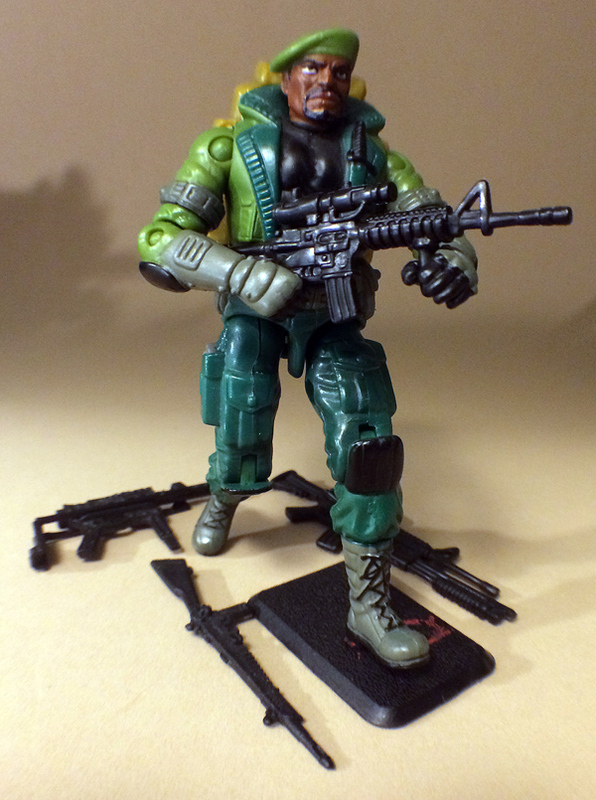 Stalker”, this figure is a single pack repaint of the 2002 new sculpt Stalker. The colors are slightly darker and the gear is different, making this a modest improvement over the mold’s first time out. The sculpting here is solid, especially for a NS figure. Stalker has a properly sized head with a stern, focused expression. A way-too-tight shirt hugs the chest under a short-cropped undersized jacket with an oversized collar. The collar is open and pushed back, so it doesn’t register as being an armored collar, which might have worked better. The shirt is so tight that if painted in flesh tone it could have been used for a Gung Ho figure. The upper half of the figure is just a bit too fashion forward for the best ranger ever (do I need to tell you that Beachhead isn’t as awesome as Stalker? ), but the no-frills fatigue trousers and old fashioned combat boots bring Stalker back to business. The left/right gunslinger thigh holsters manage to come off as more tactically redundant than cowboy, so they look appropriate. Stalker’s gear included a pile of recycled ARAH offerings, ranging from okay to pretty good. Snow Job’s rifle is there, waiting to go to a weaponless figure in need of something. But Big Ben’s backpack and the M-16 with the scope look particularly nice with Stalker. This is one of the better-proportioned NS figures. If not for a few obvious tells, like the plastic arm rivets and unnecessary arm bands, this figure could blend in with ARAH Stalker figures without catching an eye. I’d roll the dice that a Hasbro designer was forcing on armbands to hide the bicep articulation on NS figures, but they usually just looked like bad decisions. But the rest of the decisions here are pretty good. Even the muscle hugging t-shirt is tolerable. Unlike the modern era versions of classic character, the NS versions weren’t afraid to deviate from beloved-but-stale designs and try new things. Stalker benefitted from having an updated look. The armored forearms and trendy jacket didn’t look like 1982 Stalker, but the overall design managed to maintain the character’s feel in some key ways. The beret and a chest knife called back to his first version, but the additions of a goatee and shoulder/knee pads gave Stalker an extra dash of meanness. Some NS re-designs didn’t work out (hey, Zartan! ), but some did. Stalker’s redesign was smart. For being a figure early in the NS line, it set a high watermark that many following figures failed to reach. Looking back at what I wrote when this fig was released, I really liked the mold and it’s a solid Stalker upgrade. Unfortunately, this entire style of figure just appears dated now. Too old to be desirable for anniversary style collectors and too new for vintage collectors to care. But, at least Hasbro kind of tried during these years. Certainly more than have in the past 5. Shame that the second Baroness mold ever became a weird Takara anime thing. But Hasbro never should’ve gone with t-crotches at all. There were a few t-croch defenders, which seem really weird now days when modern collectors get annoyed by any figure that has a lack of ankle or double knee joints. I’ve always appreciated this figure for the creative approach to character design. Not _my_ Stalker, but it’s a decent figure. Just a little cartoon looking. I imagine a fan of modern CORPS figures could integrate new sculpt Joes like this pretty easily into their collection. Pretty fair assessment. It’s better colored than the 2-pack release was. The cliches are there, the big collared jacket, the bicep bands, knee pads (practical gear but now most characters had them, compared to ARAH) and of course Hasbro love of goatees (van dykes)…that last one also applies to Star Wars sometimes when they want to ruin what should be a generic looking Rebel soldier..